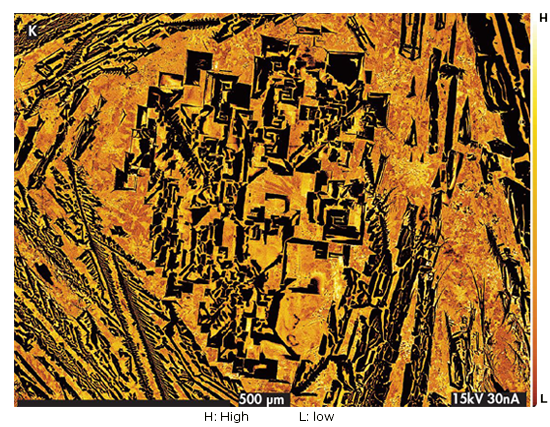 The winning image was provided by Olivier Rouer and Jean Cauzid (University of Lorraine, Nancy, France) and shows a stunning x-ray map of a slag sample from the Roman Gaul era. X-ray compositional map acquired with the SXFiveFE, showing the potassium distribution in a slag sample. Potassium is more abundant in the interstial glass and mineral mixture between the dramatically-shaped fayalitic olivines, which contain no K. This slag sample was collected from a Gallo-Roman site in Lorraine that burned at the end of the 4th century AD.